About a quarter way in in this bio-pic of President Lincoln’s last few weeks of life I kept wishing I was watching John Adams starring Paul Giamatti. Perhaps because the mini-series had more time to go into detail it was more engaging, but there was something else too, a sense of conviction. John Adams gripped in a way that Lincoln does not. Yes this film looks authentic and one is surprised by how fat James Spader got and impressed by Tommy Lee Jones as Thaddeus Stevens, but one feels Lincoln deserved a better story. Young Lincoln rather than old. Certainly one could with less of Sally Field and what the hell was J Gordon-Levitt doing popping in to play the son and then disappearing again. (Grisly though seeing all the amputated legs being dumped into the pit.) We saw all too little of events outside the White House and quite often events inside were a tad tedious. Jared Harris at Grant had barely no dialogue, it seems it was a deliberate attempt to confine us to the fug of the White House with reality kept at arms length outside the grimy White House windows. 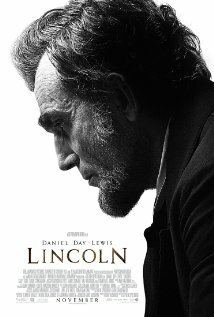 Daniel Day –Lewis does a great impersonation of Lincoln, with ticks and stories that bore everyone else to tears, but this was effectively a film about office politics and administration. Sure making sure Slavery was abolished was hugely significant, but more dramatic still would have been the days leading up to the war with the South, surely? The concentration on the passing of a bill was intense, but not great cinema. The film looked good, but failed to engage in a dramatic sense, with the exception of the comic turns of Spader, Blake-Nelson and John Hawkes. Of course I am flying in the face of 12 Oscar nominations and all the rest of the Globes and BAFTA’s, but in the end… John Adams on TV was better made, had a better script and more enlightened performances. Oh yes and where were the vampires? Only kidding.